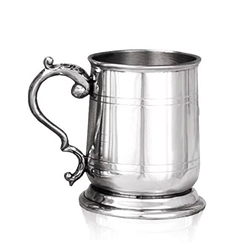 Our Cavalier Half Pint Pewter Tankard measures 3.54 inches tall by 2.95 inches wide. If you are looking for a gift for any occasion that exudes class and quality, and shows that you really care then a half pint pewter tankard really fits the bill. We draw from generations worth of experience of traditional craftsmanship techniques in the pewter ware industry to produce the highest quality gifts like this beautiful half pint tankard. The half pint tankard draws its unique design from the cavalier style and produces a beautiful effect thanks to the highly polished finish, plinth style base and expertly designed curved Georgian handle. This tankard includes a generous area on which your professional engravers can add your own personal message.